So up until recently I never really used anything on my eyebrows. I just left them alone and left it at that. But whenever I got my make-up done, the make-up artists would fill in my eyebrows...and I LOVED it! There really was a huge difference, I really thought it made me look better, and just pulled everything together. I thought how have I been living without an eyebrow kit? So after realizing I needed to start actually caring about my eyebrows besides just getting them waxed, I started researching what to buy. I talked with some make-up artists and they told me what they thought was best, some even just used a dark eyeshadow to fill in the eyebrow, which TOTALLY works! 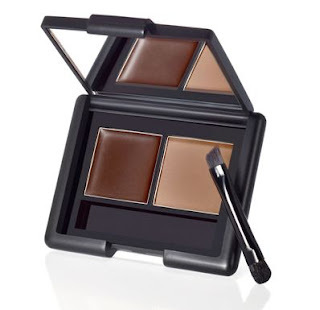 But one day when I was out shopping for make-up with my friend, and I was looking at different eyebrow kits at Sephora, when she told me about this eyebrow kit at Target that I should just get because it works really well and I won't be spending a fortune. So later that night I made Matt take me to Target to get this eyebrow kit...they were sold out(now you know its a good product when its sold out) so I asked a sales associate if they had them at a different Target...they did. So the next day Matt took me to the other Target where I purchased this amazing kit! The eyebrow kit that I raving about is the e.l.f. Studio Kit from Target. e.l.f is a brand only at Target and its made by Clinique!! Which I thought was really cool because I love Clinique, and its a brand that I trust! But my favorite part about e.l.f is that its SO AFFORDABLE!!! 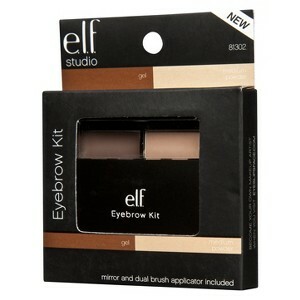 I only paid 3 DOLLARS for my eyebrow kit, and I seriously love it!